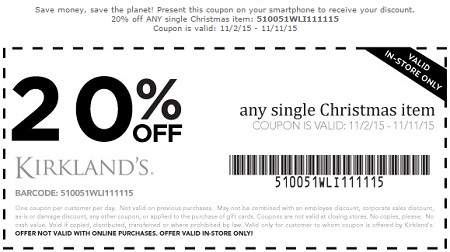 Receive an extra discount on any single Christmas item at Kirkland's stores in the U.S. Print the coupon and save 20% from retail price. Coupon must be printed to receive the offer. Source of the information is Kirkland's. Offer expires 11/11/2015. More details about the sale at Kirkland's stores. Find the way to your nearest Kirkland's store through our store locator.